People love it. People hate it. We think it's a good thing that it is polarizing because that means it's memorable. This past week we did an interview with Felt and Wire where we divulged our highly strategic and totally secret naming process for Kern and Burn, which entailed a million bad ideas and one or two good ones. 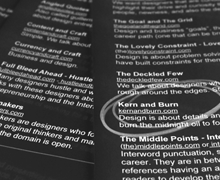 We wanted to share a little more of our process, and why we love the name Kern and Burn. We knew we wanted to gather perspectives from the design community—on design and entrepreneurship—and that we wanted to present these perspectives and stories in a way that would allow our readers to discover, learn, and be inspired. So, with that in mind, we started with the name Collective Interest. It was about the community. It was about the people. It was slightly Socialist. It was boring. Also, everything we tried to design toward the name took on a rigid, lifeless look. And the worst part was that it didn’t capture any of the life and genuine passion we felt about the topic. We also initially thought we could frame our conversations with designers as debates. We would select a topic, create a set of questions, tap two designers to go head-to-head in a Joe Duffy vs. Tibor Kalman war room style debate, and we would moderate. So, with that idea we had the names: Interpunct and The Double Point. They referenced punctuation to suggest a pairing of designers, debates, and discussion. We actually kind of liked The Double Point, but again, where’s the spirit? Finally: Kern and Burn. People love it. People hate it. We think it’s a good thing that it is polarizing because that means it’s memorable. It is also, per Ellen Lupton’s request, “ballsier.” Kern emphasizes design: the details, the dedication to work through a problem, and perfecting our craft. Burn emphasizes passion and hustle: the bursts of creativity that it takes to push an idea out into the world, broad thinking, and living life to the fullest. It also personifies the way we both work. Jess is a refiner, an admitted perfectionist, and an advocate for attention to detail. Tim is a thinker, a dreamer, and an ideas guy. Many of our contributors are great at their craft, but also bust their asses to make things happen—kern the details and burn the midnight oil. Kern and Burn is simply: to perfect our craft and work hard.